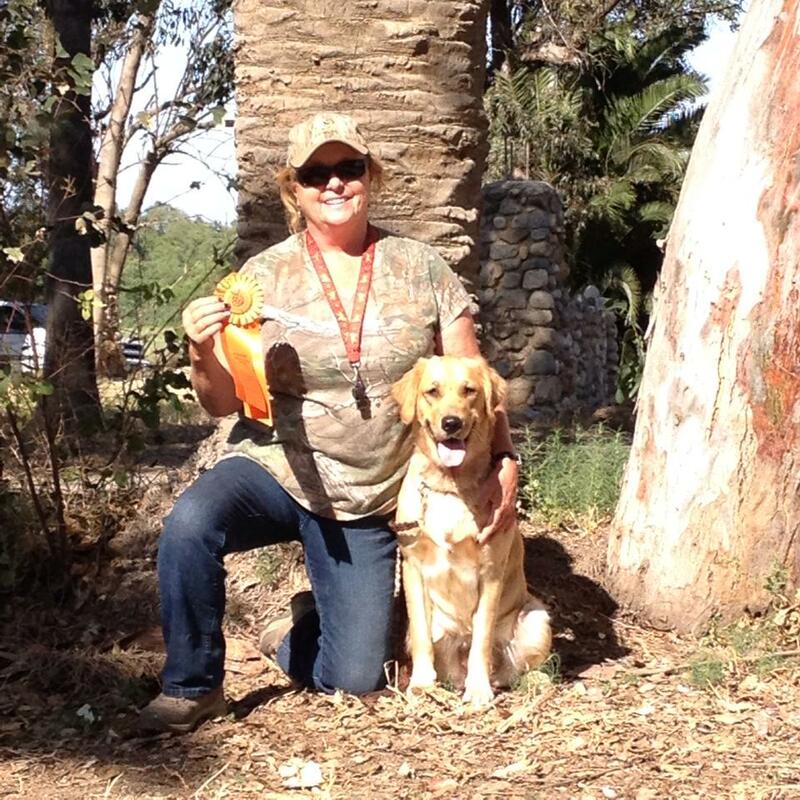 Roca earned her Master Hunter title at the Inland Valley Retriever Club Spring Hunt Test held in Chino in June. Roca was just over 3 years old when she earned her Master title, and earned 2 of the Master legs before her 3rd birthday. She is Cheryl’s 5th Master Hunter from her Magicgold breedings. Congratulations to this very talented team! 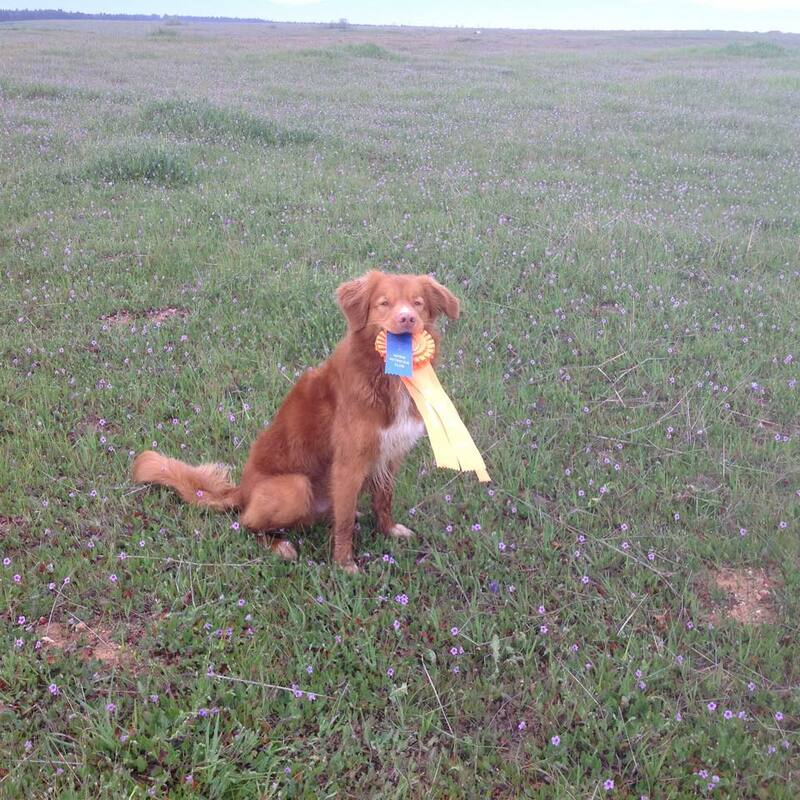 TaTa earned her Junior Hunter title at the Norcal Golden Retriever Club Hunt Test in March. TaTa ran her first test In February and earned 2 passes in Arizona at the Copper State Hunting Retriever Club Hunt Test, and then earned another pass the following weekend at the Monterey Bay Hunting Retriever Club Hunt Test. She went four for four to earn her title and at barely 10 months old! Congratulations, way to go TaTa and Cheryl!! Sammy earned the last leg for her Senior Hunter title at the Monterey Bay Hunting Retriever Club Hunt Test in February. Harvey was out of town, so Cheryl stepped in and handled Sammy for her title. Harvey and Sammy received their first SH leg at the Hills Ferry Hunting Retriever Club Hunt Test last year, a second at the Flat-Coated Retriever Society Specialty, and the third at the Sagehens Retriever Club Hunt Test last Fall. Congratulations to this very hard working team!! Congratulations to Pat and Tux on earning their Senior Hunter title at the Monterey Bay Hunting Retriever Club Hunt Test in February! Tux received his first two SH legs last September at the Sagehens Retriever Club Hunt Test at Denverton. They took a little road trip to Chino in November and earned their third SH leg at the Great Western Flat-Coated Retriever Club Hunt Test. Great job Pat and Tux! Congratulations to Rion and Kathy for getting 5 straight passes to earn their Senior Hunter title with an extra bonus pass! They earned their first SH leg at the Monterey Bay Hunting Retriever Club Hunt Test in February, and a month later they were earning their title at the Marin Retriever Club Spring Hunt Test. In between, they took a little road trip to Nevada and received 2 passes at the Las Vegas Hunting Retriever Club Hunt Test. Rion was just 20 months old when he earned his Senior Hunter title! This very talented team has also already earned their first Master Hunter pass at the Redwood Empire Retriever Club Hunt Test in August. Way to go Kathy and Rion!! Congratulations to Kerry and Rowdy on earning their Junior Hunter title in February at the Copper State Hunting Retriever Club Hunt Test in Arizona. Kerry handled Rowdy to earn his first 2 JH passes last November at the Great Western Flat-Coated Retriever Club Hunt Test, and then Cheryl took him to Arizona in February and earned the final 2 passes for his title at the Copper State test. Kerry and Rowdy also earned their Working Certificate title at the Flat-Coated Retriever Society 2015 Specialty in April, as well as a JAM in the Unsteady Singles! They earned extra JH legs at the Monterey Bay Hunting Retriever Club test and the FCR Specialty Great job Kerry and Rowdy! See you in Senior next! Congratulations to Xan and Vixen for going 5 for 5 and earning their Junior Hunter title with an extra pass! Xan and Vixen got their first JH pass at the Flat Coated Retriever Society 2014 Specialty. They earned 2 passes at the Hills Ferry Hunting Retriever Club Hunt Test in March, and the following weekend they earned another 2 passes at the Marin Retriever Club Spring Hunt Test to complete their JH title. In April, Vixen and Xan earned their Working Certificate title at the Flat Coated Retriever Society Specialty. Nice job Xan and Vixen, way to go!! Congratulations to Hazy and Cathy for earning their Junior Hunter title in style with 4 straight passes plus a bonus pass! Hazy got her first 2 passes at the Norcal Golden Retriever Club Hunt Test in March and followed that with a pass at the Lassen Retriever Club Hunt Test in April. 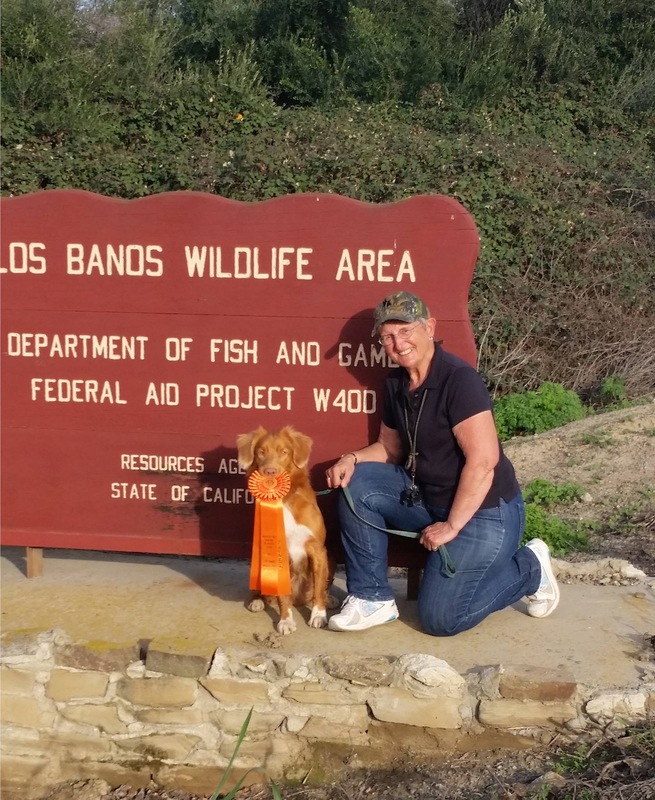 She finished her title at the Inland Valley Retriever Club Spring Test in June. Can’t wait to watch this hard charging team in Senior. Way to go! 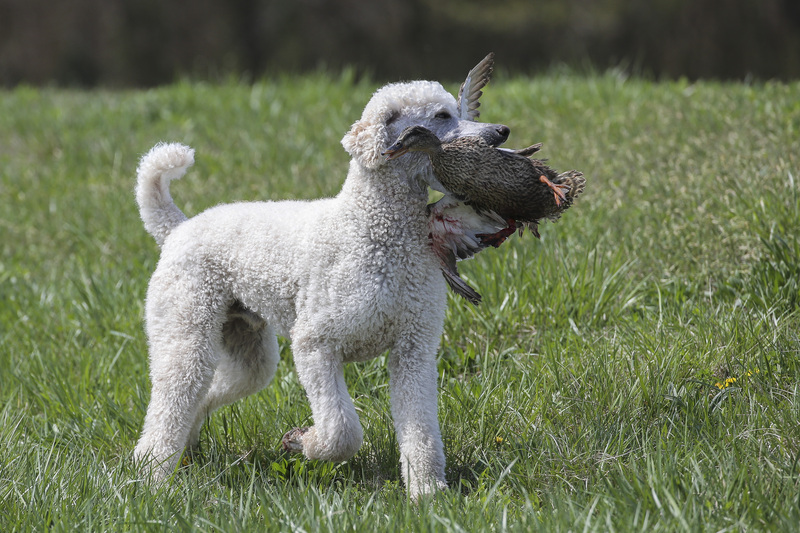 Congratulations to Paddy and Tyler for earning their first Master Hunter pass at the Poodle Club of America National Specialty held in Maryland in April! Paddy and Tyler took a cross-country training trip this past Spring, ending in Maryland to run at their National Specialty. They spent about a month traveling and training in different areas before arriving at the Specialty. What a great way to end their trip! Great job Paddy and Tyler!! Magicgold Ruff ‘N Ready To Go MH, WCX – “Reegan” – o/h Bruce Hayes – Golden Retriever Female. Reegan earned 2 additional MH legs at this test. Handled by Cheryl. Magicgold’s Orient Express MH, WCX, UDX, OM1 – “Jade” – o/h Suzanne Mikolajcik – Golden Retriever Female. Jade earned another MH leg at this test. Magicgold Ruff ‘N Ready To Go MH, WCX – “Reegan” – o/h Bruce Hayes – Golden Retriever Female. Reegan earned another MH leg at this test. Fern Hill Sunrise at the Ryman MH, WCX – “Ryman” – o/h Ardith Osborn – Golden Retriever Male. Ryman earned another MH leg at this test. Magicgold Ruff ‘N Ready To Go MH, WCX – “Reegan” – o/h Bruce Hayes – Golden Retriever Female. Reegan earned another MH leg at this test. This pass qualifies Reegan for the 2015 Master National. 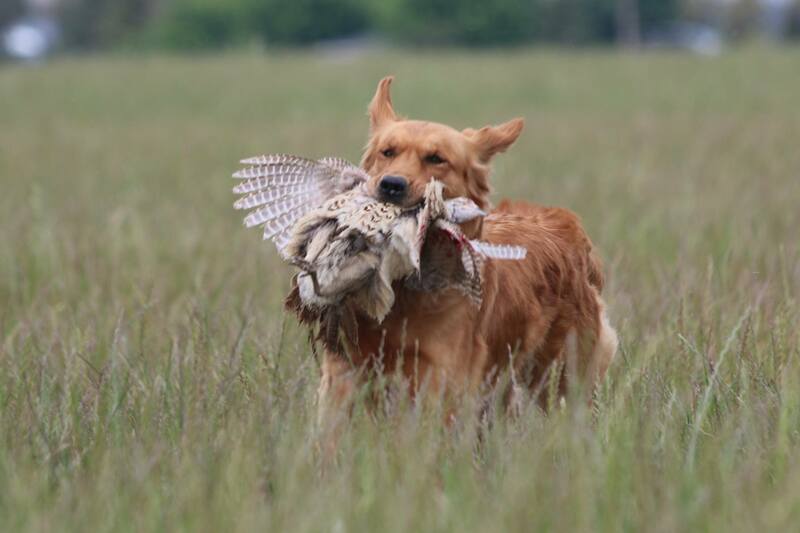 Wright’s Mindy’s Independent Girl MH, WCX – “Indee” – o/h Bruce Hayes – Golden Retriever Female. Indee earned another MH leg at this test. Shannara’s Flyte of the Rav’n – “Flyte” – o/h Pat Rohde – Flat-Coated Retriever Female. Flyte earned her second JH leg at this test. Magicgold’s It Has To Be Shasta SH, UD – “Shasta” – o/h Sue Stauffer – Golden Retriever Female. Shasta earned her 3rd MH leg at this test. Magicgold’s Orient Express MH, WCX, UDX, OM1 – “Jade” – o/h Suzanne Mikolajcik – Golden Retriever Female. Jade earned another MH leg at this test. This pass qualifies Jade for the 2015 Master National. Magicgold’s Celtic Causeway MH, WCX, **, OD – “Keltie” – o/h Cheryl Baca – Golden Retriever Female. Keltie earned another MH leg at this test. Magicgold Ruff ‘N Ready To Go MH, WCX – “Reegan” – o/h Bruce Hayes – Golden Retriever Female. Reegan earned another 2 MH legs at this test.